Reunion Runs is returning to the streets of downtown Arlington Heights for the Second Annual race on Saturday, June 17, 2017. Runners/walkers are encouraged to register by Thursday, June 1, 2017 for a guaranteed personalized bib — that’s 7 days away. Race organizer Colin Mason, a 1996 graduate of St. Viator, was a three-sport athlete (football, basketball, baseball) at St. Viator. He organized his inaugural Reunion Run last year with a bundle of positive vibes, and he’s organized another Saturday morning race. This year’s 5K is Saturday, June 17, 2017 in downtown Arlington Heights with a Start Time of 8:30 a.m.
Colin Mason, in his 10th year as a special education teacher and assistant varsity boys basketball coach at Vernon Hills, found the time to organize Reunion Runs — a 5K run/walk designed for fun, where participants gather with old classmates, get a race bib with the name of their high school alma mater across the top and printed with their school colors. On the other side of the finish line is a race after-party at Arlington Ale House with post race food and drink specials. Theres also a trophy for best retro high school outfit, and all division winners. There’s also a Reunion Run Traveling Cup. Rolling Meadows currently possesses the Traveling Cup. 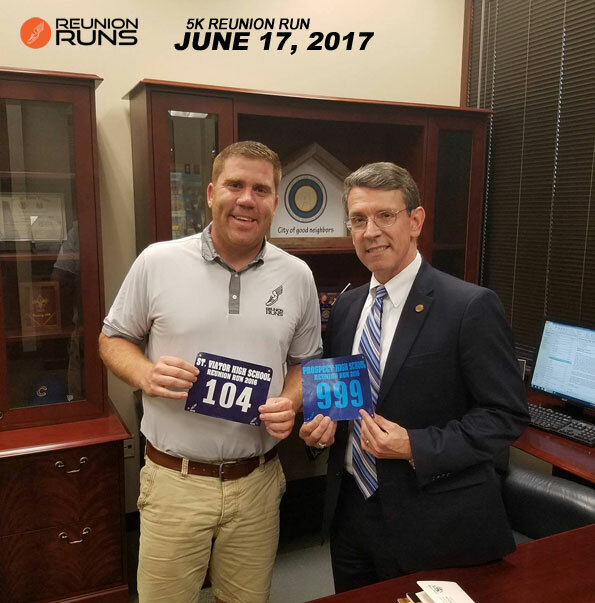 Colin Mason and Mayor Tom Hayes showing their Reunion Run racing bibs.